The Word as a Wordle is back. After a few techy, Java based problems, finally I can get this trusty 'work horse' working again! 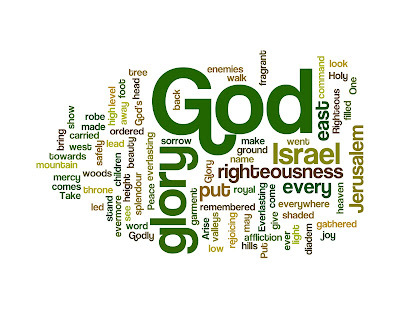 Here is the Old Testament reading from Baruch 5:1-9, which you can read here, as a Wordle. In the majest of the text, I am struck afresh at how all that is prophesied, is fulfilled by God alone and for His glory.